Epo-Tek® H20E is a two components, 100% solid silver-filled epoxy system designed specifically for chip bonding in microelectronic and optoelectronic applications. It is also used extensively for thermal management applications due to its high thermal conductivity. It has proven itself to be extremely reliable over many years of service and is still the conductive adhesive of choice for new applications. It is also available in a single components frozen syringe.Epoxy Technology’s Epo-Tek® H20E has been used successfully for over 35 years in a wide variety of applications including LED, solar, high power management and HDD applications. EPO-TEK® EK1000 – a new generation, single component ECA with exceptional thermal conductivity for high power applications with a thermal conductivity value ranging from 12.6 to 22.0 W/m°K. EPO-TEK® EJ2189 – a new generation, two component ECA designed for low temperature curing from 23°C (ambient) to 80°C that exhibits superior adhesion to a wide variety of substrates including most metals, ceramics, glass and plastics. EPO-TEK®E2101 is a two component, thixotropic, electrically conductive adhesive. It may be used for circuit assembly and semiconductor applications. EPO-TEK® E3001-HV is a snap cure, single component, silver-filled die attach adhesive for semiconductor plastic IC packaging. It is also available in a frozen syringe. EPO-TEK®E3082 is a single component, silver filled, electrically and thermally conductive adhesive for semiconductor die attach, hybrid, electronics and optical applications. It is a one component version of EPO-TEK®E2082. EPO-TEK®E4110 is an electrically conductive, silver-filled epoxy paste. This two component system is designed for low temperature curing from ambient to 80°C, although other heat cures can be used. EPO-TEK®ED 1003 is a single component, electrically conductive adhesive designed for high power LED die attach applications. Its combination of high thermal conductivity, shiny silver appearance and low outgassing are ideal for the demanding requirements of high brightness LED’s. Other features include a long potlife, low viscosity and high thixotropic index making it suitable for a wide range of application methods wafer level stamping and syringe dispensing. EPO-TEK®ED1021 is a single component, silver-filled epoxy designed for low power semiconductor LED die attach applications. Unique features include its ability to achieve high thermal conductivity values at low cure temperatures and a very shiny silver appearance which enhances overall LED brightness. Other benefits include long pot-life, low viscosity and high thixotropymakng it ideal for wafer level tamping as well as syringe dispensing. EPO-TEK® EJ2189-LV is a low viscosity, two-component, room temperature curing conductive epoxy. Epo-Tek® EK 1000 is a single components, silver-filled adhesive that exhibits exceptional thermal and electrical conductivity along with a shiny silver appearance making it ideal for the demanding requirements of high power LED die attach applications. Other benefits include low viscosity and high thixotropy making it suitable for a wide range of application techniques. EPO-TEK®EM127 is a single component, heat curable, electrically conductive epoxy adhesive for semiconductor IC and LED die attach applications. EPO-TEK®H20E-PFC is a two component, semiconductor grade epoxy, designed for flip chip interconnects using a solder-free joining method. EPO-TEK® H20S is a modified version of EPO-TEK®H20E, designed primarily for die stamping and dispensing techniques for chip bonding. EPO-TEK®H20S is a highly reliable, two component, silver-filled epoxy with a smooth, thixotropic consistency. In addition to the high electrical conductivity, the short curing cycles, the proven reliability, and the convenient mix ratio, EPO-TEK® H20S is extremely simple to use. EPO-TEK®H31 is a single component, silver-filled, electrically conductive epoxy designed for semiconductor die attach applications found in hybrids, JEDEC, and opto-electronic packaging. EPO-TEK®H35-175MP is a single component, silver-filled epoxy for military hybrid die and component attach. EPO-TEK®H37-MP is a single component, electrically conductive, thixotropic silver-filled adhesive for die-attach and SMD attach inside hybrid microelectronic packages. It is also available in a frozen syringe. Epoxy Technology’s optical line of adhesives is used for bonding and protective coatings in various fiber optic applications. Our epoxy adhesives are frequently used to bundle optical fibers and bond components in optoelectronic devices such as: telecommunication networks, aircraft, satellites as well as medical and scientific instruments. Epo-Tek® 383ND, an 8-hour pot life version, are commonly used in fiber connections for coating over stripped fibers or for ferrule potting. Epo-Tek® 301 and EPO-TEK 301-2 are two component, clear and colorless, room temperature curing epoxies for sensor applications in IR and medical CT detectors. Both are USP Class VI approved. Epo-Tek® 310M-2 is a two component, room temperature curing, highly flexible epoxy for bonding stress sensitive components. USP Class VI approved. Epo-Tek® OD2002 is a two component, high Tg epoxy with low modulus and good toughness. It is autoclavable and exhibits low stress on large core glass fibers in connectors. Epo-Tek® 301 is a two components, room temperature curing epoxy featuring very low viscosity, and excellent optical-mechanical properties. Epo-Tek® 301-2 is a two components optical, medical, and semiconductor grade epoxy resin, with low viscosity, long pot-life, and good handling characteristics. Epo-Tek® 301-2FL is a two components optical, medical, and semiconductor grade epoxy resin. It is a more flexible version of Epo-Tek® 301-2. Epo-Tek® 302 is a two components, fast-gelling, room temperature curing epoxy, designed for electronic, optical, medical, and general applications. Epo-Tek® 302-3M is a two components epoxy used for optical, medical, fiber optic, and semiconductor applications. The epoxy is good for adhesive joining, sealing, potting, or as a coating. Epo-Tek® 305 is a two component, semi-rigid, optical grade epoxy for semiconductor packaging of fiber optics, optoelectronics and medical devices. It is an electrically and thermally insulating epoxy. Epo-Tek® 310 M2 is a two component, optically clear, flexible epoxy adhesive designed for optical applications within semiconductor, fiber optic and medical industries. It is an alternative to Epo-Tek® 310M. Epo-Tek® 320 is a two components, black-colored and optically opaque epoxy designed for optical, medical, and optoelectronic packaging of semiconductor devices and components. It is a widely used fiber-optic grade epoxy. Epo-Tek® 323LP is a longer pot life version of Epo-Tek® 353ND designed for semiconductor, hybrid, fiber-optic, hard-disk drive and medical applications. Epo-Tek® 353ND-T is a two component, highly thixotropic epoxy with non-flowing properties and high temperature resistance. EPO-TEK®354 is a two component, high Tg epoxy designed for semiconductor packaging in medical, fiber optic and optoelectronic assemblies. It is an electrically and thermally insulating epoxy. Epo-Tek® 360 is a two component, high-temperature grade epoxy for semiconductor, electronics, fiber optics and medical applications. Epo-Tek® 377 is a two components, high Tg, fiber optic grade epoxy adhesive. It is well suited for semiconductor, medical and optical applications. Epo-Tek® 383ND is a slightly longer pot life version of Epo-Tek® 353ND designed for high temperature, optical and structural applications inside the semiconductor, hybrid, electronic, fiber optic and medical industries. Epo-Tek® OD2002 is a high Tg version of Epo-Tek® 353ND with low modulus and good toughness. Replacement for Epo-Tek® 354. It complies with USP Class VI biocompatibility standards. Epo-Tek® OM125 is two component, high Tg, optical epoxy designed for bonding multi-mode fiber optic connectors. Epo-Tek® 920-FL is a two component, high Tg, electrically insulating, thermally conductive epoxy designed for thermal management applications found in semiconductor, hybrid microelectronics, PCB, and optical industries. It is a low viscosity version of Epo-Tek® 920. Epo-Tek® 930-4 is a two component, thermally conductive epoxy, formulated with a very fine boron-nitride filler particle. It is also available in a single component frozen syringe. Epo-Tek®H65-175MP is a single component, alumina-filled epoxy for military hybrid die and component attach. It can also be used for semiconductor and high temperature ceramic and vacuum packaging. Epo-Tek®H67MP is a single component, thermally conductive epoxy for military hybrid die and component attach. It can also be used for semiconductor and high temperature ceramic and vacuum packaging. Epo-Tek® H70E is a two component, thermally conductive, electrically insulating epoxy designed for chip bonding in microelectronic and optoelectronics applications. Epo-Tek®H70E-2 is a two component, thermally conductive electrically insulating epoxy designed for glob-top chip protection in TAB and COB die-attach technologies. It is used to prevent chips from being mechanically damaged during micro-package assembly and handling. Epo-Tek®H74 is a two component, thermally conductive epoxy designed for hybrid circuit assembly including die attach, substrate attach, lid-seal, heat dissipation, and hermetic sealing in general. Epo-Tek® H77 is a two component, thermally conductive, electrically insulating epoxy system designed for lid-sealing of hybrids found in hermetic packaging of micro-electronics. Lids can be ceramic, glass, aluminum or kovar. Package types can be plastic, metal cases or ceramic. Epo-Tek® T7109 is a two component, thermally conductive epoxy designed for die attach and heat-sinking applications found in the semiconductor, hybrid, medical and optical industries. Epo-Tek® T7109-19 is a flexible, thermally conductive, electrically insulating epoxy paste designed for low stress and heat dissipation applications. It is an alternative to Epo-Tek® T7109-17, designed for higher strength. Epo-Tek® T7110 is a two component, thermally conductive, electrically insulating epoxy designed for heat sinking electronics and semiconductors. It may be used as an adhesive, potting, or encapsulation material, for industries such as consumer, medical or optics. Epo-Tek® T905BN-3 is a thermally conductive, electrically insulating epoxy designed for heat sinking and encapsulation. Epo-Tek® TD 1001 is a single components, thermally conductive, electrically insulating epoxy designed for low stress semiconductor and electronics packaging. Low Tg, several weeks of pot-life and low modulus are a few of its traits. It is particularly suitable for bonding ferrite cores in power device plastic packaging. It guarentees an excellent adhesion to PCBs, ceramics, most metals and lead-frames. Epo-Tek® TV 2001 is a two components, thermally conductive, electrically insulating epoxy designed for low stress semiconductor and electronics packaging. Low Tg, moderate potlife, snap-curing and very low modulus are a few of its traits. It is particularly suitable for bonding ferrite cores in power device plastic packaging. It insures an excellent adhesion to PCBs, ceramics, most metals and lead-frames. It is also available in a frozen syringe. Epo-Tek® TZ101 is a single component, electrically insulating, thermally conductive epoxy adhesive designed for heatsinking of semiconductors, hybrids, electronics, and optics. It is also available in a frozen syringe. Outgassing is a measure of the level of residual low molecular weight species (including water if the material is not conditioned in a low moisture environment prior to testing) that can be evolved at elevated temperatures. One method for measuring levels of outgassing is Thermal Gravimetric Analysis or TGA. This technique measures very small weight changes in a material as a function of temperature. The resultant percent weight versus temperature curve is then used to determine the weight loss or outgassing at specific temperatures. Below is an example of a typical weight loss vs. temperature scan. Products that meet the NASA outgassing requirements must exhibit less than 1.0% Total Mass Loss (TML) after being exposed to 125°C for 24 hours in a vacuum. They must also contribute less than 0.1% Collected Volatile Condensable Materials (CVCM) during this exposure. For military applications, products must produce 1.0% or less outgassing when exposed to 200°C in order to pass MIL-STD 883 Method 5011. Epoxy Technology is an approved DSCC testing facility for this standard. The fiber optic industry goes by many names including: photonics, telecommunications or optical components. There are many testing requirements within this industry. Epoxy Technology adhesives have been tested in accordance with Telcordia (formerly Bellcore) Standard GR-1221, “Generic Reliability Assurance Requirement for Passive Optical Components”. This testing helps to assure the practical, useful life for certain manufactured devices relating to long term (25 year) performance. For this test, the cured adhesive is heated from 50°C to 150°C at 5°C/minute in the TGA. A 0.1% weight loss for heat cured systems and a 0.25% weight loss for UV cured systems is considered evidence of a properly cured system and meets the test requirements. Below is a listing of EPO-TEK products that have met or exceeded this standard. Single component epoxies that cure at low temperatures (below 50 degrees C) need to be delivered frozen. These are usually shipped in specially insulated cartons containing « dry ice ». N.B. Most of our two component epoxies can be delivered in ready-to-use syringes. Water inhibits the curing reaction of all epoxies. This means that humidity present in the air could cause an epoxy to cure more slowly than normal or prevent complete curing. In most cases, humidity in the air doesn’t have any measurable effect. So how does humidity cause problems? 1) If the epoxy is colder than the air temperature, water vapor will condense onto it. 2) If the epoxy is applied as a very thin layer, the surface area-to-volume ratio becomes so great that a significant amount of water can be adsorbed onto its surface. 3) Epoxy hardeners (part B) are hydrophilic. Therefore the container should never be left open for longer than necessary. The mix ratio defines the proportion of epoxy resin (part A) that should be mixed with the hardener (part B). In most cases, it is best to measure the parts by weight. A mix ratio of 10:1 means 10g part A + 1g part B.
N.B. Although the mix ratio is not critical, variations will result in slightly different end-products. Whereas a mixture containing an excess of part A will still cure, a mixture with an excess of part B may remain soft and appear not to cure! This is actually due to the presence of unreacted part B which acts as a « plasticizer ». While many Epoxies cure at room temperature, a heat cure step is recommended to achieve optimum properties. See the complete brochure concerning Low Outgassing. UV and light curing adhesives are designed to adhere to a wide range of substrates in demanding applications. Formulated for bonding, coating and encapsulating properties, these adhesives are ideal for applications which require resistance to thermal cycling under vibration, environmental exposure or biocompatibility. An extensive platform of variable-viscosity acrylic-based UV curable adhesives to expand the range of bonding applications. Expertise to formulate products for special applications. Greater consistency of performance through innovative product packaging. U303 Plastic to plastic in medical applications; ISO 10993-5 also suitable for sealing an potting. U305 Plastic to plastic in medical applications: ISO 10993-5. U306 Glass to Metal in medical applications: ISO 10993-5. U320 Very good adhesion on « one use » type packaging such as Plastic blisters, used as an alternative to welding. U321 Plastic to plastic combinations; very good on PETG. U330 Plastic to plastic combinations; very good on PC. U340 Very good on overall plastic to plastic combinations; especially on PC, PMMA and PETG. U341 Very good on overall plastic to plastic combinations; also suitable to bond plastic to glass. U350 Very good on glass applications; also in combination with metal, respectively for parts with different coefficients of expansion. U351 Very suitable on glass applications. U359 Very suitable on glass applications, very high viscosity and thixotropic behavior. (gel). U356 Glass bonding with high viscosity and thixotropic behavior. see the Cyberbond UV secector chart. Norland Optical and Electronic Adhesives are designed for fast, precision bonding, and will simplify processes that require critical alignment or exact positioning. These one part adhesives will set in seconds when exposed to ultraviolet light, and can provide excellent light transmission over a wide spectral range. Our Optical Glues are designed for bonding where low strain, optical clarity or low outgassing are required in military, aerospace, fiber optics or commercial optics. These one part adhesives will set in seconds with UV light or cure with heat to form an electrically insulating bond to fasten, tack or fill. Areas not exposed to UV light can cure because of a latent heat catalyst. 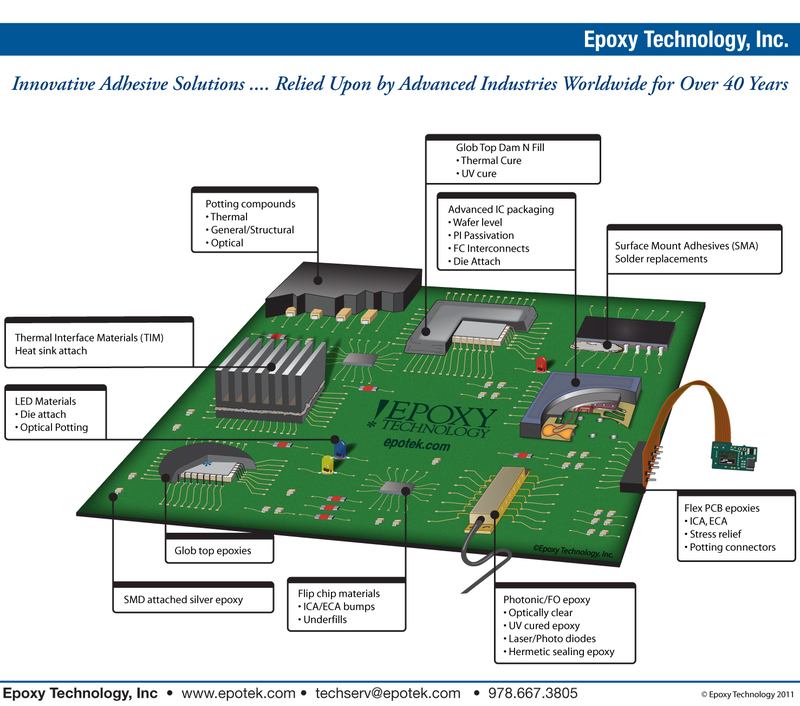 Epoxy Technology, Inc. offers a complete line of high performance Ultraviolet (UV) cure adhesives ranging in viscosity, flexibility, refractive index and light transmission. UV cure epoxies provide advantages such as extremely fast curing rates, single component (no mixing) chemistries, solventless, accurate alignment of components, ease of automation, improved production rates and thermal energy savings over conventional systems (little power consumption) by the elimination of all or part of curing by heat. The selection of an adhesive for a specific application depends on many factors such as viscosity, post-cure strength and hardness, shrinkage, Tg, the type of surface to be bonded, surface transparency, bond area and design/geometry. One must also consider the application method, such as having the proper viscosity/rheology to accurately deposit and apply the material. Another important criteria is refractive index. The refractive index of a material is the most important property of any optical system that transmits light. It is also used to calculate the focusing power of lenses, and the dispersive power of prisms. UV cured epoxies may cure more slowly than acrylate based resins. Once the epoxy has been exposed to sufficient UV light, it will eventually cure at room temperature or very quickly with the addition of heat as a second step. Epo-Tek® UVO-114 is a single components, UV curable epoxy, designed for adhesive, sealing, coating and encapsulating applications found in semiconductor, electro-optics, fiber optics, medical, and scientific/OEM industries. Epo-Tek® OG116 is a single component, UV cured, high viscosity adhesive for opto-electronic applications including fiber optic packaging, sensor device, SCI-OEM optics and general electronic assembly. Notable qualities include high Tg and index of refraction. Epo-Tek® OG116-31 is a single components, UV curable epoxy adhesive and encapsulant, designed for PCB and circuit assembly applications found in semiconductor, computer, medical, and scientific/OEM industries. Epo-Tek® OG 125 is a single components, optically clear, low index of refraction, UV curable epoxy adhesive for fiber optic and opto-electronic device packaging. Epo-Tek® OG133-8 is a single component, UV curable, thixotropic flexible epoxy adhesive/encapsulant designed for semiconductor and opto-electronic packaging. Glob top over IC and wire bonds, and low stress bonding of fiber optic components, are common applications. It is a replacement for EPO-TEK® OG133-5, and a non-flow version of EPO-TEK® OG133-7. Epo-Tek® OG 134 is single components, optically clear, low refraction (Nd), UV curable epoxy adhesive for fiber optic and opto-electronic device packaging. Epo-Tek® OG 142 is a single components, UV curable epoxy, designed for adhesive, sealing and encapsulating applications found in semiconductor, electro-optics, fiber optics, medical, and scientific/OEM industries. It is a high Tg epoxy, ideal for LCD and OLED applications. Epo-Tek® OG147 is a single component, optically opaque, UV curable epoxy, designed for adhesive, sealing, and encapsulating applications found in semiconductor, electro-optics, fiber optics, circuit assembly, medical, and scientific/OEM industries. It is a high viscosity epoxy ideal for blocking out light in opto-packages. Epo-Tek® OG147-7 is a single component, thixotropic, UV curable epoxy, designed for adhesive, sealing, and encapsulating applications found in semiconductor, electro-optics, fiber optics, medical, and scientific / OEM industries. It is a high viscosity epoxy ideal for COB glob top “dam” encapsulation processes. Epo-Tek® OG 159-2 is a single components, high viscosity, UV curable epoxy adhesive designed for sealing glass plates together in the LCD/OLED/display industry. It contains 1mil glass beads for bond line control. Common applications include semiconductor, electro-optics, fiber optic,and scientific/OEM. It can be applied by screen printing or dispensing techniques. It is capable of coating, adhering, sealing, and encapsulating devices. Epo-Tek® OG175 is single components, optically clear, low refraction (Nd), UV curable epoxy adhesive for fiber optic and opto-electronic device packaging. Epo-Tek® OG 603 is a single components, low viscosity, UV curable adhesive designed for curing in seconds. It is an all-purpose, general adhesive for optical applications including fiber optic components, DVD, medical, and PCB level electro-optics. It can also be used for sealing and coating applications. It meets the requirements of USP Class VI biocompatibility standards for medical implants. Novagard® Silicones UV cured inks and coatings maintain all of the enhanced performance characteristics of conventional silicone based materials with processing speeds unmatched by other technologies. Based on patented, ultraviolet-energy cure chemistry exclusively available from Novagard® Silicones, the 800 Series products possess a speed and depth of cure far exceeding most other UV cure systems. This unique chemistry allows deep sections to cure almost instantly. If desired, a moisture curable component provides for shadow curing in those areas unexposed to the ultraviolet light source. Description: The Novagard UV/Dual cure sealants are available in flowables, pastes and gels. These products will cure within three seconds when exposed to a UV light source. They are ideal for increasing through-put and eliminating the need to rack parts. Our paste products can be foamed up to 1/4” thick to reduce material costs.